If I Have a Cavity and It Doesn't Hurt, Why Should I Fix It? Each tooth has three distinct layers. The outermost layer of the tooth (the white part that you see when you smile) is the enamel. 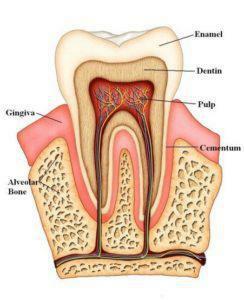 The layer under the enamel is called dentin. The dentin is yellow in color and is also hard, but not nearly as hard as the enamel. Lastly, directly underneath the dentin is the pulp. It is here where the nerve of the tooth is located. The nerve of your tooth communicates directly to the brain, and this nerve is responsible for transmitting signals that your brain perceives as cold, hot, and pain. 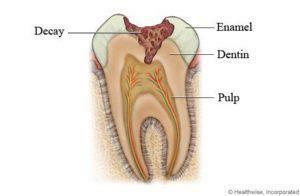 When we have tooth decay (a cavity) the decay will enter the tooth at the enamel layer. Once it passes through the enamel (the hardest tissue in the human body) and gets into the dentin, it will spread quickly through the remaining layers of the tooth. This process is different for all patients. For some, it will take months for the decay to pass the three layers of each tooth. For others, it only takes weeks. Once the doctor has found decay on your tooth, we prescribe treating the tooth quickly so you can prevent it from invading more tooth structure and travelling to the deeper layers. Since the enamel is the outermost and strongest layer of the tooth, many patients do not report any pain when the cavity is in this early phase of tooth decay. But when the patient starts to have sensitivity to hot, cold, sweets, or have pain this means the decay has spread much deeper. In order to restore decayed teeth (teeth with cavities) it is crucial to remove all of the decay and preserve the largest amount of sound tooth structure. The less tooth structure the doctors have to remove, the less likely the tooth will require an invasive restorative process. Examples of restorations for teeth are fillings, inlays/onlays, crowns, and root canals. The last resort is to remove a decayed tooth that cannot be restored, and these are called extractions. Extracting a tooth and not restoring (replacing) the missing tooth with a prosthetic (such as an implant, bridge, or partial denture) has greater consequences that are also costly. Therefore, once the doctor has notified the patient that he/she has active decay in their teeth, it is recommended for you to receive treatment as soon as possible. In short, it is in your best interest to treat the decay as soon as possible because the decay will continue to grow and spread. The deeper the cavity is, the more money it will cost you to fix it. CEREC stands for “CERamic REConstruction”. It is a high technology system that allows for the design and fabrication of dental restorations of the highest quality, without metal, made in a single visit. Developed by Sirona, CEREC utilizes photography in three dimensions and CAD / CAM (Computer Aided Design / Computer Aided Manufacturing) technology that allows your dentist to design your dental restoration virtually without taking a traditional impression of your teeth. High precision mill and sintering ovens are on-site and we are now able to fabricate your crown, bridge, or inlay / onlay while you comfortably wait in your chair. There are no guidelines for how often you should come and see the dentist. Many dentists only focus on on fixing problems rather than preventing them. However in La Michoacana Dental Clinic, we focus on both; preventing and fixing your problems. When scheduling dental appointments, we base ourselves on each patient’s oral hygiene, habits and medical conditions. If you take excellent care of your teeth and gums at home, you still need to see a dentist regularly. Patients with very little risk of cavities or gum disease can do fine seeing a dentist at least twice a year. Patients with a high risk of dental disease must need to visit every three to four months or even more. Always ask the dentist for the best-recommended schedule for your routine dental visits. Plaque is a soft, sticky film that builds up on your teeth and contains millions of bacteria. The bacteria in plaque cause tooth decay and gum disease if they are not removed regularly through brushing and flossing. The bacteria in plaque use the sugars in the food we eat daily to produce acids that will eat the tooth enamel. This attack causes the enamel to break down, eventually resulting in a cavity (a hole) in the tooth surface. When plaque is not removed daily by brushing, flossing and rinsing, eventually hardens into tartar, brushing and flossing becomes more difficult as tartar collects at the gum line. As the tartar, plaque and bacteria continue to increase, the gum tissue can become red, swollen, and possibly bleed when you brush your teeth. This is called gingivitis, an early stage of gum (periodontal) disease. You can always treat plaque by brushing your teeth twice a day, floss between your teeth to remove plaque from the places where your toothbrush can’t reach, and rinse every day after each brushing. Periodontal Disease is a serious gum infection that damages gums and can destroy the jawbone. What causes periodontal disease is the bacteria in the dental plaque. Plaque is the sticky substance that forms on your teeth soon after you have eaten. To get rid of these bacteria, our cells in the immune system release substances that inflame and damage the gums. This leads to swollen, bleeding gums, a sign of gingivitis (an early sign of the periodontal disease). If your gums bleed and you think it’s normal, you are completely wrong. Swollen and bleeding gums can be early signs that your gums are infected with bacteria. If you never do something about it, the infection will spread and will destroy the structures that support your teeth in your jawbone. Eventually, your teeth start to loose and they will need to be extracted or will fall on their own. You can always prevent periodontal disease by practicing good oral hygiene and visiting your dentist regularly. Most people should see the doctor every six months, but if you have active periodontal disease you will need to visit more than twice a year, with periodontal disease, you will need to need to visit at least every 2 to 3 months a year.